Eagle eyed European Waterways guests will now be treated to magnificent demonstrations of the art of falconry as part of the company’s exclusive “insider experiences” on hotel barge cruises aboard the Spirit of Scotland and Scottish Highlander in Scotland and Shannon Princess in Ireland. These demonstrations feature a striking display of aerial acrobatics from birds of prey that include falcons, hawks, eagles, owls, and vultures –set against the backdrop of the Scottish Highlands or the walled gardens of a stately manor in Ireland. Guests are then invited to get “up close and personal” with the birds as they perch and take off from their arms, swooping high above the countryside. According to Derek Banks, managing director of European Waterways, experiential opportunities like these, among many others, are driving record bookings for the company this year. Departures for all three vessels are nearly sold out for 2018, and 2019 departures are already selling fast as customers take advantage of prices that are still at 2018 levels across most of their fleet. Prices start at $4,190 per person or $30,500 for whole boat charters on the Scottish Highlander; $4,450 per person or $44,000 for charters of the Spirit of Scotland; and $4,400 per person or $37,100 for a whole boat charters of the Shannon Princess. All cabin prices are based on double occupancy. The eight-passenger Scottish Highlander and 12-passenger Spirit of Scotland – one of the newest in the European Waterways fleet – cruise the Caledonian Canal through the celebrated highlands of Scotland, past famous castles, historic battlegrounds, and spectacular wildlife, glens and lochs, including Loch Ness, where the falconry demonstrations take place. 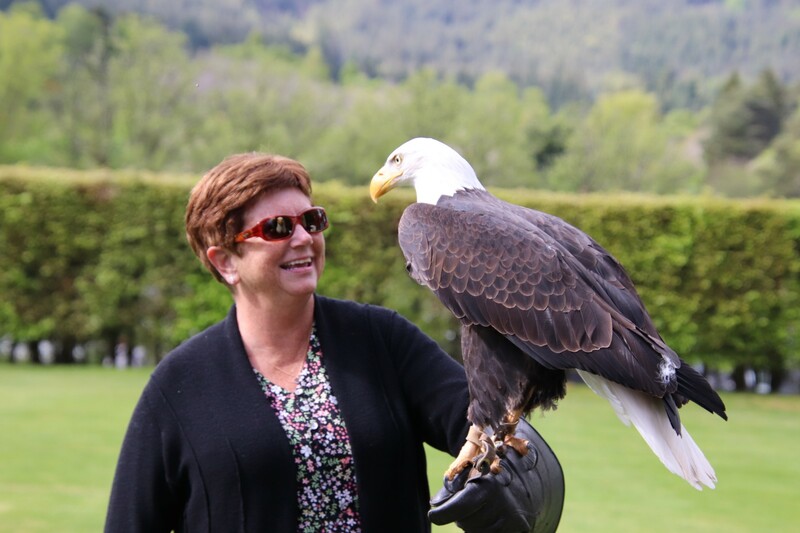 In addition to a visit to the private Highland Club, a former 19th century Benedictine Monastery, and the birds of prey experience, guests enjoy a tour and private tasting at the Glen Ord whisky distillery, among other excursions. The hotel barges drift through many of the renowned Scottish lochs, including Dochfour, Ness, Oich, and Lochy. Along the way, guests will also tour Cawdor Castle and gardens, inspiration for Shakespeare’s Macbeth, and the Eilean Donan Castle – filming location for the James Bond thriller, The World is Not Enough. The sweeping beauty of the highlands is a constant source of fascination, punctuated by frequent sightings of the diverse wildlife that calls the region home. Tailored golf, whisky trail, honeymoon, and family charters are also available. The 10-passenger Shannon Princess cruises the River Shannon through the legends and lore of the Irish countryside. Its panoramic windows look out to the rolling green landscape and ancient Celtic landmarks that include historic ruins, castles and grand estates. The falconry demonstrations take place inside the walled garden of Adare Manor, a magnificent estate on the banks of the River Maigue. Exclusive tours take guests through Portumna Castle, a carefully restored, semi-fortified castle overlooking the river in the town of Galway, and the legendary 6th century Clonmacnoise ruins, an ancient monastic site that was visited by Pope John Paul II while in Ireland in 1979. Guests will also visit Leap Castle, believed to be haunted due to its violent past, which includes murder, deceit and great treachery amongst its former owners and local clans. The cruise also offers an excellent opportunity for fishing and walking and, throughout, a sampling of the “black stuff,” Guinness. For more information and pricing, contact European Waterways. A complete list of specials can be found at https://www.europeanwaterways.com/special-offers/?y=2018. Hotel Barging is a boutique, unique experience which offers an immersive, all-inclusive “gentle voyage of discovery” that focuses upon the culture, history, fine wine and gourmet cuisine of the region. With a 6 to 20 person capacity and 1:2 crew ratio, European Waterways are able to provide an impeccable level of on board service and can transport their guests on the intimate inland waterways that are inaccessible to larger vessels. This fascinating network of smaller canals allows for flexibility, spontaneity and ample opportunity to hop off and explore the beautiful surroundings via bicycle, or on foot. In addition to this there are daily, chauffeured excursions “off the beaten track” to a wide variety of enthralling locations, from exquisite wine tastings to private tours of stately homes. With over 40 years’ experience and a fleet that spans nine countries it is the largest luxury hotel barging company in Europe.